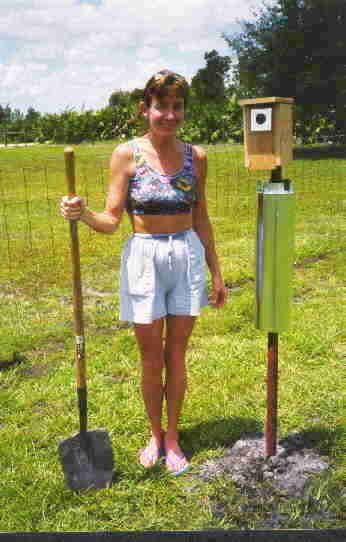 M1 1 This was the First Trail in Manatee County, and 1st Box that I put up in Christy's Bluebird Project! After checking days later, I found what I know now, to have been a Claimstraw in this box. But, due to too soft of soil, that the box had been set up in, and also that the door nail fell out, the box would not stay upright. Flooding and the soil which could not be compacted to hold the box in the ground, made this an unsuccessful location. 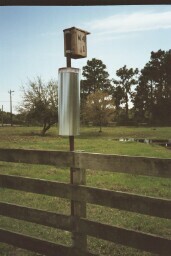 M 4 BOXES WERE MOUNTED ON THE FENCE AND UP HIGH TO KEEP THEM AWAY FROM THE HORSES. BELOW ARE PROBABLY THE FIRST BB EGGS LAID IN FLORIDA - FEB. 27, 2003. BUT THESE EGGS NEVER HATCHED AND SEEMED TO BE ABANDONED. This was our Project's MOST Successful Trail, for a few years. There were Over 20 Fledglings each year! But, the Monitor sold this property, and the new owner, may still get the Bluebirds, but is not reporting to me. The box below never did have a successful breeding. This box was made in Indiana, I believe, and given to the son. It had a 4 by 4" floor with very little ventilation. It also was mounted on a fence about 3 feet off the ground. The new boxes were mounted 6 ft up on the same fence, and were used over and over. 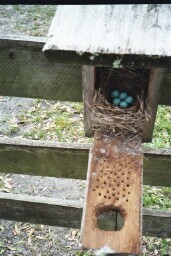 These 5 eggs were the First Eastern Bluebird Eggs for year 2003 in the United States! I was very happy for this Monitor because the eggs were found in the box his father had made and given him. His father had died just a few days, I believe before the eggs were found. I thought this was very special. M 5 1 - 5 AL "The Church House Trail"
Al Built The Entire 5 Box Setups Himself! M 5 Was our most Eastern Monitored Trail. This Trail was in what was the parking area to a drive-in Church. Located across the street from the Bay, and right off of U.S. 41 or the Tamiami Trail. After Monitoring for two years this site was given up, and the boxes moved to be used out East of the Interstate. Al built his entire 5 box setup and set them in cement blocks to stand. This was a true birding experiment. No birds appeared to try and use any of the boxes. 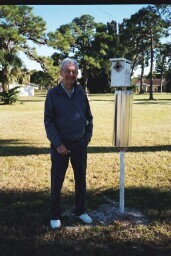 Al has since, made another full 5 box setup which someone out East won in a Drawing. Al, like myself does not have Bluebirds, but he is a Great Bluebird Friend!